Organic and natural face masks are really helpful and good for your skin. A mixture of gram flour with turmeric is one beauty secret that has shown wonders when it comes to skin care. Besan and Haldi, also popularly known as gram flour and Turmeric, are rich in fibre, proteins, magnesium and iron. To make the most of this power-packed ingredient, you can use it as a face pack. >Control oiliness: Besan powder with haldi combats oiliness. 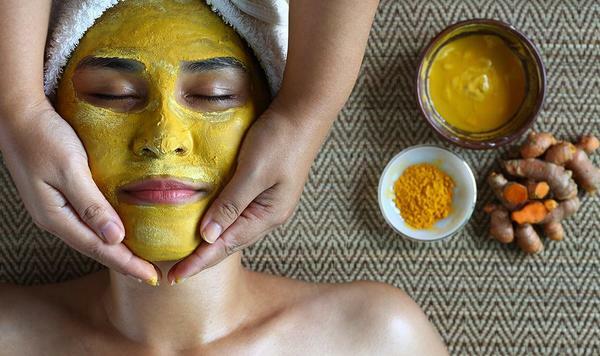 Haldi will moisturize your skin and the besan will sluice your pores. Together, they will help control the production of excess sebum on your face. >To reduce acne scars: Mix besan, turmeric powder and water to create a paste to apply on your face and neck. The vitamin-rich besan combined with powerful turmeric works its way deep into the skin to exile dogged acne scars slowly and steadily. >To brighten skin: A mixture of besan and turmeric is a sure-certain way to brighten your skin. Turmeric present in the mixture combines with the fiber in besan to scrub away the dead cells and reveal brighter skin that’s lying underneath. >Better skin complextion: This is one pack which can be used on all skin types. Just blend besan, lime juice and turmeric with rose water to make a paste. Apply the face pack, and wash it off after it dries. A regular use of it will not only give a lighter complexion but will also make your skin smooth and glowing. So, start using besan-haldi mask to get a glowing face in this summer.